Harriet Carter Wednesday: Your Sisters Snowman Stinks! Happy Harriet Carter Wednesday to one and all! Well, not to all of you, but to some. Anylog, this week Harriet tries to explain how your douche-bag sister was made, provides us with a cartoon snowman to fake buy, and reminds us what we need to do when we smell bad things. Let’s go! 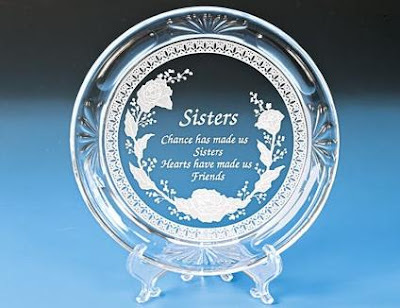 Product # 1 – Oh the love between sisters can never be represented better than etched onto a plastic plate that you’re not supposed to eat off of. Heaven forbid you toss a slice of pizza on that high-falutin’ $10.00 dish. Anyway, this plate has a wonderful saying on it that only sisters can apparently share. It states: Sisters. Chance Has Made Us Sisters, Hearts Have Made Us Friends.” I’m not entirely sure how accurate that is, however. Perhaps it should say something catchy, yet true like: “Sisters. Dad Was a Drunk and Mom Was a Whore. That’s How You Were Created. Let Me Walk Ya Through It, Sis. You See, Dad Has a Terrible Drinking and Gambling Problem and Mom, Well Mom, Banged Her Way Through the Marriage In Order to Lessen the Amount of Times She Was Slapped With Dad’s Belt Because She Never Could Quite Get the Roast Recipe Down Right, Or On Time. It Was Purely a Numbers Game For Mom. One Night, In Order to Not Have to “Kiss the Door Knob Again,” Mom Decided to Give It Up to Dad and 6 Months Later You Were Born. It Was Only Six Months Because Mom Liked to Smoke Whilst Pregnant and Drink Too! So, On the Sixth Month She Gave Birth To You Under The Basement Stairs in a Cardboard Box Covered With the Funnies Section of the Sunday Paper. Sisters.” See now doesn’t that sound better? Sure it’s a little long, but perhaps they could extend it onto multiple plastic looking plates and you could collect all 241 pieces. Way to market, Harriet, way to market. Product # 2 – Fakey the Snowman was fake cartoon snowman. With a missing corn bob pipe and a street cone nose and two eyes made out of the devil soul! Come on you know the rest! I love Fakey the Snowman, but is there any chance before I buy this snowman that lights up and remains possessed the entire night that I can actually see what this will look like for real? I mean, I no longer live in the same cartoon neighborhood I did before so I’m not too sure that this cartoon snowman will work with my real life house and real life snow. I’m a little confused on the payment as well. Now can I pay for my cartoon snowman with my cartoon money? Perhaps you accept VIZZA or MonsterCard? 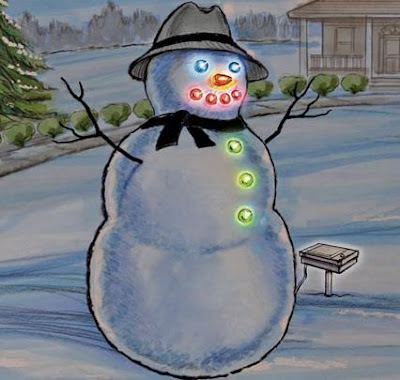 And how the hell big is Fakey the Snowman because he looks like if you put him up against the house his old man hat would be a bit taller than the chimney. Oh, and thanks for putting in the extra effort to draw the background. Oh yes, are those trees in the background or just scratch marks? I’m going to go with scratch marks. Luckily I get it because my cartoon neighborhood used to have scratch marks too. Nice scarf too on Fakey the Snowman. I’m sure the neighborhood kids will be bending him over before the holiday season is over. Ho ho huh? Product # 3 – I wasn’t informed that you were still allowed to pinch your nose closed when something smelled bad if you weren’t 4 years old or in an I Love Lucy episode, but apparently the ban has been lifted. First off, I’m glad that Marie Osmond is back to work after her stint on Dancing With the Stars. It just proves that being on that show can revitalize your career. Second, what in the name of jihad chemicals is this product called? ATMSKLEAR? Like, ATMS Lear? Derived from the German phrase meaning “Money Scam.” Third, where did the rest of faux Marie Osmond’s hair go? She’s about 2 inches away from completing her Zac Efron. It’s the new “Rachel” apparently. And you totally know that the only thing that stinks is faux Marie’s own hoo-ha. That thing probably hasn’t seen clean water since her days on The Love Boat. Hopefully ATMKILLER stuff doesn’t burn the skin because faux Marie is going to need to insert the whole bottle into her “gentleman greeter” the same way you tip a Pepsi bottle filled with water into the plant soil so the plant can just drink as much as it needs when it needs it. You still with me? I’m borderline lost, but I think I’m still typing. Perhaps she has that surprised look on her face because Harriet is underneath her and inserting the bottle as the picture is being taken? Either way her lady business stinks. Clean it up.